In the Old School Renaissance, the truth is that Advanced Dungeons & Dragons does not get as much love as other versions of the classic fantasy RPG. The problem is that Advanced Dungeons & Dragons is the more complex than the other versions of the classic fantasy RPG, it is not as flexible, and it shows its wargaming roots more clearly. In comparison, both Dungeons & Dragons and Basic Dungeons & Dragons are simpler, more malleable, and have proved the easier basis for multiple Retroclones, from OSRIC and Swords & Wizardry to Labyrinth Lord and Lamentations of the Flame Princess Weird Fantasy Role-Playing. Yet this does not mean that Advanced Dungeons & Dragons has not formed the basis for Retroclones, most notably Advanced Labyrinth Lord and Astonishing Swordsmen & Sorcerers of Hyperborea. The former is a close emulation of Advanced Dungeons & Dragons, building from Labyrinth Lord, whilst the latter is not just an emulation of Advanced Dungeons & Dragons, but also a development of it, both in terms of mechanics and setting. Published in 2012 by North Wind Adventures following a successful Kickstarter campaign, Astonishing Swordsmen & Sorcerers of Hyperborea: A Roleplaying Game of Swords, Sorcery, and Wierd Fantasy takes its cues from two sources. Mechanically, it takes its mechanical cue from Advanced Dungeons & Dragons, but streamlines many of the mechanics in play, from Saving Throws to the infamous ‘THACO’, whilst also adding a simple resolution system for actions that take place out of combat or do not specifically pertain to a Class and its abilities. Inspirationally, it also takes its cue from Advanced Dungeons & Dragons, specifically certain books suggested in Appendix N, that is the weird fiction of Robert E. Howard, H.P. Lovecraft, and Clark Ashton Smith, and this is expressed most obviously in its default setting of Hyperborea and in the creatures and entities drawn from Lovecraftian fiction that populate its setting. 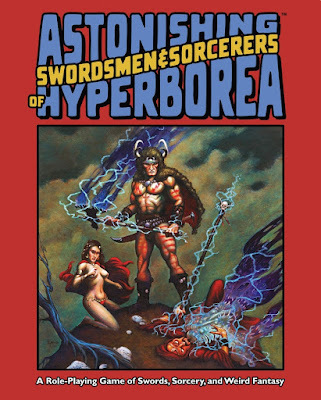 Currently, Astonishing Swordsmen & Sorcerers of Hyperborea is only available as a PDF, but originally it was published as a deep boxed set containing a pair of digest-sized spiral bound books. One was the two-hundred-and-fifty-two page Players’ Manual, the other the two-hundred-and-thirty-six page Referee’s Manual. Besides this, the box contained a poster map of Hperborea, six character sheets, and a set of polyhedral dice. Each of the spiral bound books is divided into three volumes. The Players’ Manual is divided into Volume I: Swordsmen & Sorcery, Volume II: Sorcery, and Volume III: Adventure & Combat, whilst the Referee’s Manual is divided into Volume IV: Bestiary, Volume V: Treasure, and Volume VI: Hyperborea Gazetteer. It is this boxed set that Reviews from R’lyeh will be reviewing. With an RPG like Astonishing Swordsmen & Sorcerers of Hyperborea, the place to start is with the types of characters that can be played. In terms of Race, the Hyperborea setting gives nine pure races of mankind—Amazon, Atlantean, Esquimaux, Hyperborean, Ixian, Kelt, Kimmerian, Pict, and Viking as well as two distinct mixed races, Kimmeri-Kelt and Half-Blood Pict. In addition to these, men of indeterminate ancestry are simply of ‘Common’ stock. What is important to note about all of these Races is that none of them provide anything in the way of mechanical benefit and they are simply integral to the Hyperborea setting. They are also the only player characters Races available as Astonishing Swordsmen & Sorcerers of Hyperborea does not include any non-humans as playable Races. In terms of Classes, Astonishing Swordsmen & Sorcerers of Hyperborea gives the four basics—Fighter, Magician, Cleric, and Thief—and then a whole lot more. For each of the four basic Classes, there are four or five Subclasses. Thus for the Fighter there is the Barbarian, the Berserker, the Cataphract, the Ranger, and the Warlock; along with the Magician there is the Illusionist, Necromancer, Pyromancer, and Witch; the Cleric includes the Druid, Monk, Priest, and Shaman; and for the Thief, there is the Assassin, the Bard, the Legerdemainist, and the Scout. Most of these look very much like their counterparts in Advanced Dungeons & Dragons, but some need a little explanation. The Cataphract is warrior-knight or cavalryman, the Warlock is a spell-casting fighter; the Necromancer practices black magic and consorts with the undead, the Pyromancer specialises in fire magic, and the Witch specialises in potions, portents, and curses; the Priest is more mystic than warrior, and the Shaman, or Witch Doctor, communes with ancestral and totem spirits; and the Bard or Skald is a warrior, scholar, and master of music, the Legerdemainist is a Thief who uses sorcery, and the Scout is an explorer and intelligence gatherer. The use of these Subclasses is regarded as an option rather the default. Beyond this, a character in Astonishing Swordsmen & Sorcerers of Hyperborea can only advance as high as Twelfth Level, shares the same attributes as Advanced Dungeons & Dragons, uses Hit Points and descending Armour Class, and so on, but there are notable differences as can be seen below. Height: 5’ 6” Weight: 145 lbs. What is noticeable about the derived factors from the attributes is that Strength differentiates between the To Hit and Damage bonuses and has both Test of Strength and Extraordinary Feat of Strength factors. These equate to Open Doors and Bend Bars/Lift Gates respectively in Advanced Dungeons & Dragons, the Test of Strength being rolled on a six sided die and the Extraordinary Feat of Strength rolled as a percentile. Astonishing Swordsmen & Sorcerers of Hyperborea goes further and applies the two resolution mechanisms to Dexterity and Constitution as well as Strength. The ‘Test of…’ is a way of handling a character who wants to take a non-standard action that relates to a physical attribute, whilst the ‘Extraordinary Feat of…’ represents a player character undertaking a superhuman action. Perhaps the biggest change in Astonishing Swordsmen & Sorcerers of Hyperborea is the addition of Fighting Ability. Every character has this. It does two things. First, it simply measures how good the character is at physical combat when compared to a Fighter-type Class of the same Level. The Fighting Ability of a Fighter will always increase as he goes up a Level, up to the maximum of Twelfth Level, but a Cleric or a Magician will not. Thus a Thief will have Fighting Ability of 1 at First Level, of 2 at Third Level, of 3 at Level Four, and so on. Second, it simply serves as a Class’ bonus to hit at any one particular Level, this bonus or Fighting Ability being applied to the one table. All Classes possess the Fighting Ability, but some Classes also have the Casting Ability, the capacity to use sorcery (which will be examined later), and Turning Ability, the capacity to turn or control the undead. However, Fighting Ability is so beautiful in its elegance and simplicity, let alone the fact that it deals away with multiple tables for handling combat. Armour Class works as you would expect, but minor tweaks. Notably that it provides some damage reduction, whilst larger shields provide better Armour Class adjustment against missile attacks. Saving Throws are also streamlined. In Advanced Dungeons & Dragons there are five categories of Saving Throw—‘Paralyzation, Poison, or Death Magic’, ‘Rod, Staff, or Wand’, ‘Petrification or Polymorph’, ‘Breath Weapon’, and ‘Spells’. In Astonishing Swordsmen & Sorcerers of Hyperborea there is just one generic Saving Throw for all Classes which improves as a player character goes up in Levels. Astonishing Swordsmen & Sorcerers of Hyperborea also breaks its Saving Throws down in five categories—Death, Transformation, Device, Avoidance, and Sorcery—but rather they become modifiers to the core Saving Throw. The type of modifier a player character has will depend upon his Class. For example, Olaf the Short, is a Fighter and therefore receives the modifiers Death +2 and Transformation +2. A character’s Attributes may also provide additional modifiers. Like the Fighting Ability and Casting Ability, this is a streamlined and elegant method of handling an old mechanism that also avoids the need for big tables. Alignment is similarly streamlined. Astonishing Swordsmen & Sorcerers of Hyperborea reduces the seven options found in Advanced Dungeons & Dragons to just five—Lawful Good, Lawful Evil, Chaotic Good, Chaotic Evil, and Neutral. It removes the purity of both Law and Chaos and perhaps may not be as nuanced as some Gamemasters and their campaigns, might like. The approach to skills in Astonishing Swordsmen & Sorcerers of Hyperborea is ambivalent. Just like Advanced Dungeons & Dragons, the Thief Class in Astonishing Swordsmen & Sorcerers of Hyperborea includes a list of skills useful to all aspects of theft and stealth and detecting traps and so on. This is rolled on a twelve-sided die, not percentile dice, and may be modified by a Thief’s Dexterity if high enough. So for example, a First Level Thief would have skills of Climb 8:12, Decipher Script 0:12, Discern Noise 4:12, Hide 5:12, Manipulate Traps 3:12, Move Silently 5:12, Open Locks 3:12, Pick Pockets 4:12, and Read Scrolls –. The Ranger’s Track ability works in a similar fashion. In addition, there is a mechanic for a character undertaking an action not covered by his Class, that is, a nonstandard action. For example, a Magician might want to pick the pockets of a merchant or a Bard wants to recall what he knows about a hero of old. The chance of this is expressed much like the Test of Strength, but is typically low, for example, 1:6. At least there is a mechanic for this, but why not turn it into a unified task resolution and have the Test of Strength, the Thief’s skills, the Ranger’s Track ability, and this unskilled test all resolved on a twelve-sided die and allow a character’s Attributes to modify the results? Having separate small mechanisms in this fashion is an annoying hangover from Advanced Dungeons & Dragons and makes no sense in terms of aesthetics or design. Combat is for the most part little different to Advanced Dungeons & Dragons, with attack rolls on a twenty-sided die made against an opponent’s Armour Class, with damage inflicted then being deducted from his Hit points. The rules cover most eventualities, notably unarmed combat—always an issue in Advanced Dungeons & Dragons, whilst the advanced rules cover a variety of options and manoeuvres from Arrow Setting and Disarm to Throw and Attack and Two-Weapon Fighting, as well as Critical Hits. Initiative is handled normally, except that a combatant armed with longer weapon against one armed with a shorter weapon, may be able to strike first. Perhaps the first real disappointment with Astonishing Swordsmen & Sorcerers of Hyperborea is in its approach to sorcery. It provides spell lists for each of its various spell-casting Classes, the spells starting at First Level and ending at Sixth Level, as well as covering learning and casting spells, researching spells, and so on. Now this is all well and good, but the spells do not inspire and they do not feel appropriate to the genre that Astonishing Swordsmen & Sorcerers of Hyperborea is based upon. Magic in Swords & Sorcery is typically dangerous, not just to those it is cast upon, but also upon the caster, and the magic in Astonishing Swordsmen & Sorcerers of Hyperborea is never that. This is because it does not really deviate from the magic of Advanced Dungeons & Dragons, of E. Gary Gygax and Jack Vance. Height: 5’ 5” Weight: 140 lbs. The bestiary in Astonishing Swordsmen & Sorcerers of Hyperborea is a mix of the old and the new, or rather the old and the weird. What is noticeable by their absence is the Goblinoid family of foes—Goblins, Hobgoblins, and Bugbears—although Gnolls, here called Hyæna Men, and Orcs, here called Dæmon-Picts, are present and take on a more bestial and more demonic natures respectively. The rest is mix of the traditional Dungeons & Dragons creatures and the weird of Cthulhu Mythos. So we have the Aboleth, the Black Pudding, the Chimæra, the Gargoyle, the Gelatinous Cube, and so on from Dungeons & Dragons, whilst the Deep Dweller, the Elder Thing, the Great Race, the Night-Gaunt, the Shoggoth, and so on, from the Cthulhu Mythos. There are some changes and new entries too. For example, Hill Giants are known as Formorians and Golems are called Automata, and whilst the materials they are constructed from remain the same, whether clay, flesh, iron, or stone, take on the feel of ancient technology rather than magical constructs. New creatures include Leaper Camels (a kangaroo-like marsupial ridden by the Abominable Snow-Men and the Men of leng), Lotus Women (plant-like vampires that lure their prey with lamenting song), Minotrons (bronze clockworks in the form of Minotaurs), Oon (subterranean humanoids who serve the Mi-Go), and Thew Wagons (bequilled slug-like beasts that can be trained as giant beasts of burden). It is a delightful mix and in a great many cases, the monsters from Dungeons & Dragons do not look out of place alongside those from the Cthulhu Mythos. Again treasure in Astonishing Swordsmen & Sorcerers of Hyperborea feels the same as Advanced Dungeons & Dragons, but different. So alongside Plate Mail +1, Sword +2, Flame Tongue, Potion of Gaseous Form, Ring of Water Walking, Staff of the Snake, Boots of Speed, IOUN Stones, there is also the Girdle of Golden Serpents (creates a greater globe of invulnerability that has a chance of ceasing function for its current wearer, but will work for the next wearer), the Sphere of Blackness (grants use of various shadow-related spells), and the Vacuous Grimoire (reduces the Intelligence and Wisdom of the reader). Other items of treasure draw from the Pulp Sci-Fi genre, for example, the Sword +2, Laser—Star Wars eat your heart out, but then the weapon has always been there at the periphery of the Science Fantasy of Dungeons & Dragons. Other Science Fantasy weapons include the Paralysing Pistol and the Radium Pistol. Overall, Astonishing Swordsmen & Sorcerers of Hyperborea presents a good mix of magical items, but not necessarily a great one. Again, the issue is that they are too much like Dungeons & Dragons and not weird enough, not dangerous enough. The Hyperborea of Astonishing Swordsmen & Sorcerers of Hyperborea feels as if there should be a danger to using any one of the magical items, but unless they are specifically cursed, there is very little of that. Also missing is a means for the player characters to create magical items beyond potions and scrolls, which befits the ancient, but lost knowledge aspect of the Hyperborea setting. Of course, that is only lost to mankind. Some of the older and ‘elder’ races, such as the Deep-Dwellers, Dwarves—here described as “...foot-long, sickly yellow maggots” and “...cunning, evil, greedy, and lecherous; equally they are tireless forgers and brilliant dweomercafters”, Elder Things, and members of the Great Race, may have the means to create such magical or scientific devices. Rounding out Astonishing Swordsmen & Sorcerers of Hyperborea is the Hyperborea Gazetteer, which details and describes the mythic ‘micro-setting’ that is Hyperborea, that might be a land long lost to Earth or a land that lies at the North Pole. Wherever it lies, Hyperborea is an ancient land over which a giant red sun hangs, around which it has a thirteen year orbit which includes one year of midnight sun and one year of polar night. It was once home to a great race, the Ancient Hyperboreans, but whilst they were able to survive an Ice Age, their civilisation did not survive a plague known as the Green Death. There are few Ancient Hyperborean survivors and their once great civilisation now consists of ruins to be picked over by other men. The Gazetteer covers everything from Hyperborea’s astronomy and calendar to its races and religions—many of the latter including faiths and devoted to Great Old Ones like Kthulhu and Azathoth. It provides a thorough overview of Hperborea, including some mysteries and marvels, such as the great black obelisks and ancient R’lyeh. Given the presence of the weird and certainly the Cthulhu Mythos in Astonishing Swordsmen & Sorcerers of Hyperborea it seems odd that there are no rules for handling the weird and the uncanny. There are essentially no Sanity mechanics and that, when combined with the lack of threat in spellcasters using magic, points to the flaw in the RPG’s design—it never makes the weird feel personal and so never quite really brings the character Classes provided into the Hyperborea setting. Lastly it would have been nice if an equivalent of Appendix N from Advanced Dungeons & Dragons could have been provided as inspiration for the Gamemaster. Physically, Astonishing Swordsmen & Sorcerers of Hyperborea is very ably presented. It is well written and everything is well explained, the language in places being mature and rich enough, that in places it was necessary for Reviews from R’lyeh to look up the meanings of certain words. Both volumes of the rules are nicely illustrated by Ian Baggley, his dark pencils nicely depicting the dark dangers of Hyperborea. As a retroclone, Astonishing Swordsmen & Sorcerers of Hyperborea had the potential to be a superb development of Advanced Dungeons & Dragons, but unfortunately, it never gets quite beyond interesting. Mechanically the RPG provides interesting choices and some elegant redesigns of standard Dungeons & Dragons mechanisms, and there is potential in both the setting of Hyperborea and the threats it should present. Yet for all that potential, Astonishing Swordsmen & Sorcerers of Hyperborea never quite escapes the bonds of Dungeons & Dragons and never quite fully embraces the weird of its inspirational genre. The second edition of Astonishing Swordsmen & Sorcerers of Hyperborea: A Roleplaying Game of Swords, Sorcery, and Wierd Fantasy is currently funding on Kickstarter. Please check it out. More Rootin', Tootin', Shootin', Stealin' Fun!